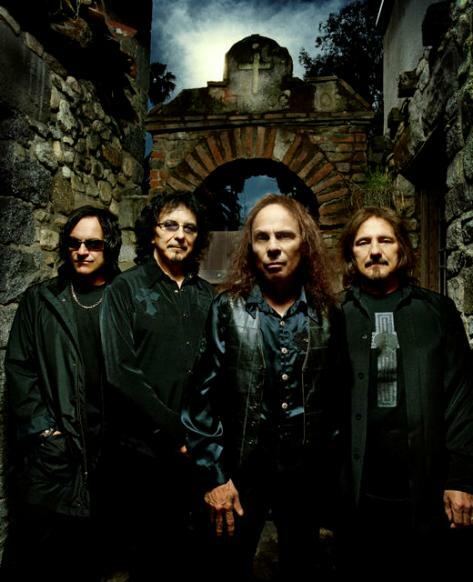 A couple of new promotional photos of HEAVEN & HELL — the band featuring Ronnie James Dio, Tony Iommi, Geezer Butler, and Vinny Appice — can be viewed below. HEAVEN & HELL's new single, "Bible Black", is available for streaming in its entirety on Noisecreep.com (look for the audio player in the middle of the page and click on the play button). The track comes off the group's long-awaited new album, "The Devil You Know", whcih will arrive on April 28 from Rhino for a suggested list price of $18.98 (physical) and $9.99 (digital). "Bible Black" begins with Iommi on acoustic guitar behind Dio's plaintive wail before the rhythm shifts to a menacing stomp for the rest of this dark tale about a book of sinister scriptures. One of the first songs written for the album, Dio says it established a tone for the rest of the album. "When you start off with a blockbuster like that, it makes the rest of the album so much easier because it gives you a benchmark to measure the other songs against."